A quick note about a couple of historically-minded events in downtown Los Angeles this weekend: Ed Kelsey's presentation at the Palace Theatre on the very eve of its centennial; and the Last Bookstore's inaugural tour of the Secret Lives of Downtown led by Brady Westwater. If you're not among the lucky ticketholders to be a part of one of the three Sunday screenings of Sunset Boulevard at the Palace Theatre in conjunction with the L.A. Conservancy's Last Remaining Seats program, you're missing a special event indeed. 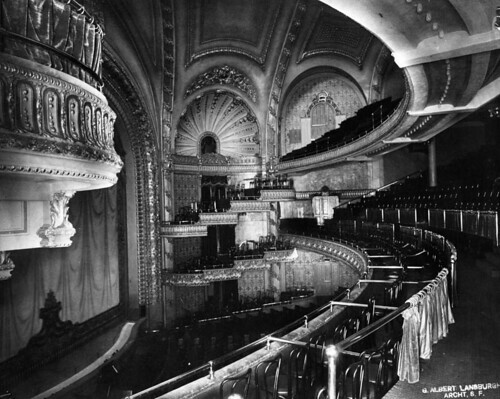 Sunday will mark 100 years to the day that architect G. Albert Landsburg's vaudeville theater opened for business on Broadway as the Orpheum. You're not entirely out of luck, though. As a special treat, the League of Historic American Theatres' Ed Kelsey will provide a special presentation on the Palace this Saturday at 11:00 a.m. at the theater. Hosted by the Los Angeles Historic Theatre Foundation, Ed's talk will be followed by your opportunity to tour the building and check out the results of the first phase of the building's restoration. Believe me, the chance to walk on the same stage on which the Marx Brothers trod is more than worth the price of admission, which for Saturday's event is free. Also this weekend, for the low price of $15 (cheap!) you can be a part of Brady Westwater's first walking tours of "secret" downtown. You may've taken any number of tours of downtown, but what I know of Mr Westwater guarantees a point of view you will not have gotten from anyone in the past. The tours are scheduled to last about 2 1/2 hours each and begin at 11:00 a.m. Saturday and noon on Sunday. As if you needed any more incentive, the tours are presented by and begin at the Last Bookstore at 5th and Spring. Maybe it's your first chance to see the shop in its new location; the Last Bookstore held its grand re-opening on June 3. For more information on The Secret Lives of Downtown, visit the shop's blog. Thanks, Brady, for the alert. And a nod to the Los Angeles Public Library for the photo. Have a great history-filled weekend, everyone. You know what's the best part of this year's Last Remaining Seats? We're getting the opportunity to spend a couple of hours in the 100-year-old Palace Theatre, and on its 100th birthday no less. LOS ANGELES (March 2, 2011) – The Los Angeles Conservancy has announced the lineup for the twenty-fifth season of Last Remaining Seats, its signature series of classic films and live entertainment in historic theatres. All screenings will take place in the movie palaces of downtown Los Angeles’ Broadway Historic Theatre District. The 2011 season runs primarily on Wednesdays at 8 p.m. from May 25 through June 29. To celebrate the twenty-fifth year, this season includes a bonus seventh show (two screenings, matinee and evening) at the Palace Theatre on Sunday, June 26, a century to the day after the theatre opened. Los Angeles Conservancy members chose the special screening through a Fan Favorite poll, selecting the 1950 classic Sunset Boulevard. This special bonus event is in conjunction with Bringing Back Broadway’s "Broadway 100," a series of events marking important milestones on Broadway. Tickets go on sale to Los Angeles Conservancy members at 10 a.m. on March 30 and to the general public at 10 a.m. on April 13, all at www.laconservancy.org. Advance tickets cost $20 ($16 for Conservancy members). The 2011 schedule appears below. All programs are subject to change; any updates will be posted in the Last Remaining Seats section of our website at www.laconservancy.org. Thriller starring James Stewart, Grace Kelly, and Thelma Ritter, directed by the master of suspense, Alfred Hitchcock. Evening host: film critic and historian Leonard Maltin. Pre-show performance by Robert York on the Orpheum's original Mighty Wurlitzer organ. At the beautifully restored Orpheum Theatre, celebrating its 85th birthday this year. The Technicolor version of the hit musical, with Robert Preston as con man Harold Hill. Special guest: Co-star Susan Luckey. At the magnificent Los Angeles Theatre, the last and grandest movie palace built on Broadway, celebrating its 80th birthday this year. Swashbuckler that catapulted Errol Flynn to stardom and garnered Academy Award® nominations for Best Picture and Best Director (Michael Curtiz). At the beautiful Million Dollar Theatre, one of the first movie palaces in the U.S. The original, timeless classic tale of beauty and the beast, starring Robert Armstrong and Fay Wray. Special guest: Pauline Wagner, Fay Wray's stunt double in the film. Filmed version of the play that made Edward James Olmos a star; based on the Sleepy Lagoon murder trial and Zoot Suit Riots of 1940s Los Angeles. Sardonic look at Hollywood starring Gloria Swanson, William Holden, and Nancy Olson; Olson is slated to appear for an interview before either the matinee or evening screening. 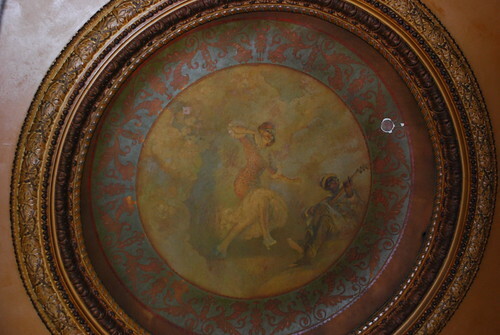 Voted Fan Favorite film by Los Angeles Conservancy members for this special bonus show celebrating the 25th season of Last Remaining Seats and the 100th birthday of the Palace Theatre, which opened June 26, 1911. Hosted by Fox-11 reporter Tony Valdez. Masterpiece of silent comedy starring Harold Lloyd, who ends up climbs up the side of a “skyscraper” on Broadway (filmed half a block from where it will be screened). Hosted by Lloyd's granddaughter Suzanne Lloyd; film accompanied live by Robert Israel on the Orpheum’s original Mighty Wurlitzer organ. For full schedule information, visit http://laconservancy.org/remaining/2011.php4. What began in 1987 as a way to draw attention to Los Angeles’ historic theatres is now a summer tradition. Thousands of people come from all over Southern California, the United States, even other countries, to experience classic films as they were meant to be seen: in beautiful, single-screen theatres filled with fellow fans, and accompanied by vintage short films, onstage interviews, and live performances. For more information, see 25 Years of Last Remaining Seats. Series Star Sponsor: Hollywood Foreign Press Association. Series Supporting Sponsor: Steve Bing. Series Sponsors: NBC Universal; Trina Turk; Valley Economic Development Corporation. Evening Sponsors: Cathy and Steve Needleman; Linda and Jerry Bruckheimer; Warner Bros.; Clifton’s and The Edison; Paramount Pictures and 213 Downtown LA Nightlife; Hugh Hefner. Media Sponsor: Los Angeles Downtown News. VIP Reception Sponsor: Bank of America/Merrill Lynch. Funded in part by: The Los Angeles County Board of Supervisors through the Los Angeles County Arts Commission; Los Angeles City Department of Cultural Affairs; The Walt Disney Company. The Los Angeles Conservancy is a nonprofit membership organization that works through education and advocacy to recognize, preserve, and revitalize the historic architectural and cultural resources of Los Angeles County. What began as a volunteer group in 1978 now has more than 6,000 members, making the Conservancy the largest local organization of its kind in the U.S. For more information, visit www.laconservancy.org.